The "New" Lindgren-Pitman quick release hub kit. 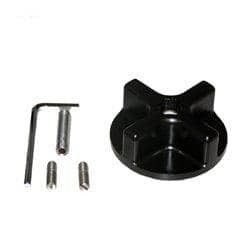 This kit is retrofittable to any LP S-1200 taking only minutes to install. It turns the S-1200 into the ultimate multi purpose fishing machine. You can now switch spools in seconds without the need for any tools! Change from a deep drop set up to a Wahoo trolling rig to a dredge set up by just swapping spools - it's that easy. It's also a must for daytime sword fishing where you can keep a couple different spools of varying diameter line to adjust for varying ocean current conditions. No other reel on the market offers such flexibility. Installation: Using the five millimeter Allen wrench supplied remove the cap head stainless screw that is located in the center of the main shaft (located directly in the center of the spool) Next remove the 4 five millimeter screws that attach the spool to the reel. Remove the spool. Now screw the two supplied stainless studs into the any of the 4 open holes that were previously used to hold the spool using a flat blade screwdriver. Which ever hole you choose put the second stud 180 degrees across from the first stud. Next using the supplied four millimeter Allen wrench screw the threaded insert into the center of the main shaft until it bottoms out. Now reinstall the spool lining up the newly installed stainless studs.